Give your child a gift to remember — a birthday party at Roaring Mouse! Our party specialist will design an art project especially selected to match your child’s favorite interest (toy, book, game, etc.) or party theme. Guests will also have access to our playroom full of imaginative toys. Ages: Our parties are best suited for children ages 2-8. Schedule: We host parties on most Saturdays and Sundays at 10am and 1pm. To view available dates, click on "Reserve A Date." Party reservations must be made at least one week in advance. Thanks! We do not schedule parties in December due to our busy Holiday Gift Making workshop schedule. To schedule a summer birthday party, please contact us here to inquire about availability. When making a reservation for your child’s birthday party, you will be asked to select the activity you are most interested in. Our party coordinator will then follow up with you and provide more information about the activity you selected and help tailor it to your child’s interests or party theme. Don’t know which activity to pick? Not to worry! Simply select “unsure” from the party menu and our party coordinator can assist you. Note: We are happy to customize a party activity to your child’s interests if you don’t see an activity you are interested in above. How long are your parties and what do the kids do? Our parties are two hours long and include an art project designed to your child’s interest (favorite toys, books, or games) or party theme. Guests also have use of our playroom. How much do your parties cost? How do I pay? Cost of an art party is $175.00. This includes your child and seven guests. Additional guests may be added for $12.50 per guest for a maximum total of 12 children participating in the project. Parents of guests are welcomed to stay during the party especially if their child will be more comfortable that way. A $50 non-refundable deposit is required and may be paid through our online reservation system. The remaining total can be made on the day of the party with cash or checks. Guests should dress to mess! What is the space like? Will I have room to serve cake? 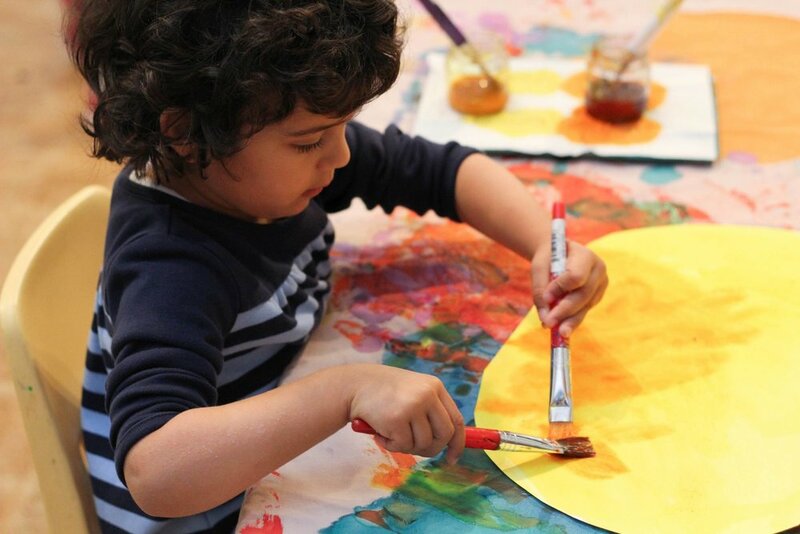 Our studio is a large room divided into two sections, the art room and playroom. The art room includes not only space for the party project but a place to celebrate your child’s birthday. Families will have access to two long tables and chairs, two side cabinets (for food), and we even have a special place for gifts. Our toys and musical instruments are available during the party, allowing the children to explore the art project at their comfort level and speed. How is the party structured? Our parties begin with a warm up time where guests are encouraged to explore the instruments/toys in playroom (15 minutes). Guests are then welcomed by teacher and encouraged to come to the project table. Projects often include 2-3 different types of art materials (painting, drawing, collaging, or sculpting). Children work on first part of project. When children are finished they may once again choose to play or if project can be extended (ex. Given paper for painting) they can choose to continue working. When all guests are finished the next part of project is set up and children are called back. Party continues in this pattern until all project parts are all completed. Some assembling is usually necessary by teacher for completion. The Birthday Child’s family may arrive 15 minutes before the start of their party time to set up whatever food items, decorations, or other party supplies they would like to use. We have a microwave available for your convenience but plan to bring a cooler if necessary. Please feel free to bring an mp3 player/phone to play during the party. You supply food, drinks, paper plates, cups, utensils and a tablecloth. A standard plastic table cloth almost fits across the two tables (about 10 inches is exposed). We are a nut free facility so please keep that in mind if planning a menu. Typical timing for cake and presents is usually around 15 minutes for each. We tend to reserve the last 30-45 minutes for this. Families can request variations (examples: presents, want to add snack/meal time) that are easily accommodated in most circumstances. Clients have a 15 minute period after party to do a basic clean up (clear food from tables and cabinets, gather decorations, presents, and personal items). We are located very close to the Roosevelt neighborhood (Whole Foods, Starbucks, Bartell, various other shopping opportunities). Two parking spaces are available in front of our studio and there is plenty of street parking. The studio is also available for Special Events. Much like birthday parties, we can customize your time at the studio. In the past we have hosted benefits, bridal showers, anniversary parties and other events such as gala opening for a local photographer displaying his work. The price for Special Events varies depending on what you’d like to do, but the reservation process is the same. To discuss event pricing, please contact us here.